It’s interesting to draw comparisons between the way film sets are run and the way the military does it. There are some startling parallels and a few remarkable differences. The director of a film crew has dictatorial powers that would raise eyebrows in most other industries. It does seem a bit military, if not medieval. It’s the Artist thing. Artists, we are told, have quirky work habits, original approaches to everyday events, and tempestuous personal lives. The greater powers tend to cut them considerable slack if they have a demonstrated ability to put butts in theater seats. Their quirks and eccentricities may be essential to their success. That’s the perception if not always the reality. Many directors are serious journeymen with a strong sense of craft. They lead fairly conventional lives. They just happen to be very good at their jobs. Whether the director is a free spirit or a quiet craftsman, he or she will get dictatorial powers on set. Whatever they ask for, no matter how whimsical it may sound, will be taken seriously. The director gets a level of control that is rarely found outside a military chain of command. Feature film crews developed around this model and have hierarchies that reflect a military structure, e.g. the DOP, Operator(s), Camera Assistant(s) have detailed job descriptions that are intentionally narrow and defined. 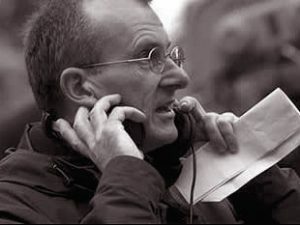 The mission in the camera department is one of executing orders from the DOP and not questioning the creative purpose of the order. “A List” camera crews are usually fast, precise, and businesslike. They make a hard job look easy, even with a Loony Tunes director. The military connection was very strong in Hollywood of the 1950’s. Many cameramen were ex-military. The Worral Head, the geared tripod head used on most of the 35mm features of the time, was adapted from a gun mount. The look and the image are so central to what a movie is that the Camera Department is, almost by definition, close to the top of the hierarchy, just below the director. A good sound crew makes every attempt to work harmoniously with all departments but especially the camera department. Other departments in the hierarchy, including sound, spread out below, ranked according to how much of the movie hinges on their work. The Special Effects guys get a lot of attention on action/adventure films while the Wardrobe and Hair departments are big on 18th Century dramas. The Sound Department usually does well on comedies. Woody Allen films contain little or no ADR and he shoots in Manhattan! It’s rare that a take will be printed without a nod from the sound mixer. Etiquette then must be appreciated as the social protocols appropriate to a feudal, quasi- military group, run by a director who might be fascinated by Japanese Gangster movies from the 1960’s, sleeps with a Teddy Bear, has a degree in engineering, and hates blue jeans (black jeans are OK). It’s no accident that this collective is often referred to as a Circus. If you are on set to do interviews with actors or EPK (electronic press kit) there are some tasks where you will need to interact with the Sound Mixer. There is a specific etiquette based on the notion that the Production Mixer is in charge of anything to do with sound on “his” set. That makes him your boss while you are on set. You will probably need a production sound feed from the sound cart. Before you dive in, check to see how things are going. Is the mixer reading the latest Wired, checking his email, and drinking a Latte? Or is he talking to three people at once on his intercom while being harassed by a red-faced 1st AD? Make sure you have your end together before you ask for something. Most EPK crews want the program feed on a wireless link. The means the EPK sound guy will ask the production mixer for a mono output of his mix. Most large mixing boards have several line outputs but rarely have mic level outputs. Most wireless transmitters have mic inputs. You should have a line level adapter cable or a 40db pad for your transmitter. It is very annoying to have the EPK guy asking you for a pad because he forgot his, or never bothered to get one. Don’t assume the Sound Mixer is interested in chatting with you or answering your questions. He may consider you a distraction, which you probably are. If you have something to say, wait until lunch. If he invites you to sit and talk, that’s OK too. Your wireless transmitters have the potential to create problems if the frequencies you use are close or identical to the actors’ mics. Let the Production Mixer know what frequencies you are using and be prepared to change frequencies if he thinks there may be a problem. Be prepared as well to remote your transmitter on a cable if there is any suspicion that your transmitter is causing a problem on his sound cart. Once you have what you need, don’t hang around the sound cart unless you’re invited. As the day goes on you may hear things between takes over the production audio channel. You might hear actors gossiping, crewmembers complaining, someone on their cell phone to their ex-wife’s lawyer, all kinds of personal stuff. The Production Mixer is supposed to mute actors’ mics when the actors are standing-by or off-set but sometimes you hear them. When you hear personal stuff, keep it to yourself. Don’t look at the person you are eavesdropping on. Above all, never record this stuff, even if it’s way better than the movie. The privacy of famous people is constantly under assault, especially the actors. Everyone on set should be looking out for the actors. It’s like looking after a bratty little sister or an eccentric uncle. 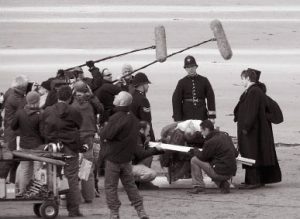 Film sets are not to be regarded as public places, even when they happen to be in a public place. There is zero tolerance on set for any paparazzi behavior. Leave your camera at home. Wireless mics have other etiquette considerations. It is a delicate and potentially dangerous operation for a male technician to place a wireless mic on female talent. Don’t be in a hurry to do this. There have been accounts of assault and harassment lawsuits based on “inappropriate touching.” It’s not unknown for actresses to have “touching issues” of which you may not be aware. There is no way to properly place a lav mic in a bra without some inappropriate touching. It all depends on the people involved. If an experienced actress over 21 says, “Do what you have to do” and pulls up her top then you’re probably OK. If a 16-year-old actress does the same thing, run away (although by then you’re already in trouble). Under no circumstances should you place a mic inside the clothing of anyone underage unless there is a guardian present. If placing a mic is a daily event, you and the actor (and the guardian) will need to work out together how it should be done. Many actors learn to put on their own wireless mics. Sometimes it’s better if a female wardrobe person does it. Other times you can enlist a woman to help out. It would be great if you could say, “It’s OK Ma’am, I’m a doctor,” but you’re not. Those days are over, even for doctors. Excerpt from “Sound Man” by Rick Patton C 2009, reprinted with permission. With over 30 years experience, Richard Patton is one of Vancouver’s most experienced and respected feature film sound mixers. Since 2007 Rick has been Branch Manager at Trew Audio Vancouver. Stay tuned for Part Two of Richard Patton’s “Set Etiquette and The Chain of Command” in the very next edition of Trew Audio’s eNews. Wow! Maybe if I had never taken part in any of what Richard spoke about in his rant I might not feel like I was being talked down to. But the simple matter of fact is that yes, I have been on movie sets before, I have had to interact with "real," movie, sound mixers before and yes, I have had to put mics on women before. In all cases I did it with grace, class and without having to be told how to act by some grumpy old mixer. To me it sounds like someone pee'ed in Richards Wheaties the morning he wrote this. Personally, I'm more than a bit offened. Now I'll admit that I haven't been doing this job as long as Rich has, but come on, give us a break! Was this article really needed? Or was it more like Richard needed some therapy time and had to get something off his chest? Either way, I didn't care for the tone or attitude of it. That and Richard wanders all over the landscape with this article. One moment he's talking how any crew member should act on a set and then he's talking about putting mics on kids and getting sued. What?!? Some of this article would be useful if I was only a couple of months down the road doing this job, but not the professional I am today. And I'll bet other sound mixers who read this column feel the same way, like we're being schooled by Capt. Crusty mixer. I'm sorry but, no thanks! And if you haven't guessed, I'll go out of my way to miss part two of this drivel. Not your best effort Trew Audio. Hey Rick, great article...I read the comments before I read the article and was surprised with what I saw (in the comments) so I must say that I think the article comes across as totally useful and professional. I do not think it comes across anything like 'Chas Gordon' characterizes it to be, crusty, etc. Nice work. Very nice article, Rick. Obviously, Chas Gordon doesn't feel he needs any of this information, but many others do. As a mixer with over 40 years of set experience I also believe in the importance of set etiquette. For several years I have mentored young sound people from a local film school and this is similar to the talk they get before visiting me on a working set. Thumbs up from this happy mixer. I especially enjoyed the last paragraph. I have faced wiring women, teenage girls, and children, and came to the same conclusion on my own. I felt like, finally, my concerns were validated. They didn't teach set etiquette specifically regarding the sound team at my film school. Good read for a newbie like me. I think this article is needed. There are some guys that are just starting out and they don't know some of the protocol. I think that 95% of set etiquette is common sense for the most part, but the first time I had to wire a woman, I was sure about not acting inappropriately. And Rick, I am sure you did not mean it that way but, there is a way of wiring a woman without some "inappropriate touching" I have been mentored by gentlemen, and I think whomever you learn from, dictates how you handle situations. Make friends with wardrobe, and you'll be laughing. For those of us on the behind-the-scenes end in TV land, I wish some producers could read this. There are far too many out there that think because we are working for TV, we are the most important. Don’t draw attention to yourself. Wear dark colors and be quiet. Turn off your cell phone. Don’t make eye contact with the actors and don’t stand in their eyeline. Don’t talk to above-the-line people unless they talk to you first. Don’t block doorways. Smile, be polite, and acknowledge the pecking order. Resist the urge to help out unless someone specifically asks for your help. Those are the basic ground rules for anybody walking onto a set for the first time. This is why I don't work on films much anymore. Years of not being able to be myself has left met bitter. I bought my own gear to get more into docs and small indie films. I am much happier and enjoying what I do. I believe the film world is a harsh work place. If you are way to sensitive of a person it's not the field you want to be in. Chas Gordon is exactly the person that I will never work with, His condescending attitude is typical of the "Know It Alls" that have no place in a professional environment. I hardly think that the articles are published for the seasoned veteren, but for the newer person working their way into the business or up that ladder. I have these articles saved and they are required reading for new members on our crews. So far, every person has thanked me for the information. Shame on you Chas. Your attitude is absurd. Beeing "new" to the north american market i found very usefull some bits of info on your article Rick. Very usefull the part about wiring kids...always have someone else with you while doing it. After 8 years in the industry i still consider this articles to be very important. Keep it up Rick and if we don´t meet before have a great Xmas. Thanks 4 all the help and the warm welcome to town. Here it is 2009 and I am pleased to see that Rick is still on the scene at Trew Audio (although I must admit I miss the old "Location Sound Inc." days). As for the article, I found it completely accurate -- as I think anyone would who actually has an aptitude for being part of a professional sound team. Chas, your commentary screams with green, and I'm not talking being sensitive to the environment. I would seriously suggest you consider a different line of work. Thanks, Rick. Doubtless I'll see you down at Trew Audio soon! Wow! I've known Rick for Y E A R S ....... and he's always been respectful and professional. Although I've "Been around the block" for a few years, I'll buy the book just based on some of the fantastic stories I haven't heard before. I too miss going to the "Old" store downtown - It was like I was going to visit my Uncle at his house. Hats off to you Rick, You've been an asset to this industry in the past and happy to hear you still share a life-long talent with us all! Cheers. The last paragraph about wiring was rather interesting. It's true that underage talent should have someone present while wiring, but unless they're a civilian, it doesn't have to be a parent or guardian. For underage actors, I've usually just had a hair, makeup or wardrobe person there. I'm not sure if this method is the legal standard, but in my experience, it sure is the industry standard. The ONLY time I've ever been asked to let the talent, hair, makeup or wardrobe do the wiring was while working with Japanese crews. In Japan, male PSM's rarely wire female talent. That's what the Japanese crews have always told me. If someone needs to be wired and it has to be hidden, and it isn't a cultural taboo to do so, I will try to persuade them to let me, or one of my crew do the wiring. If they say no, I'll respect their wishes. I am a beginner to hollywood and I'm doing every possible thing I can to get into the industry. This article was VERY helpful. If there's a book I'm buying it. Personal comment: This industry is heavily flawed with the fact that getting a job is ALL about who you know. Look at Chas here. He has a lot of experience, but I'm guessing it's because he has close friends or family in the industry. If you are in this business you better thank Rick for the advice and move on. Rick, if you're ever in California I will gladly buy you lunch.